Interestingly, there are more women working now than there were 2 years ago, when the general unemployment rate was 33% lower than it is now! This is actually a common theme during recessions. Women are disproportionately in positions which are relatively stable, such as health and education. Women also tend towards part-time positions, which are not cut as drastically by companies looking to slash costs. 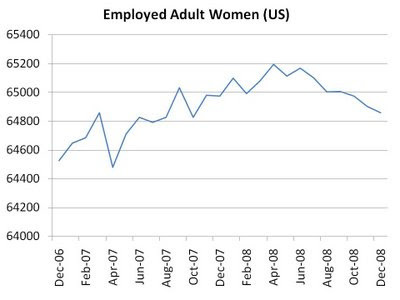 As a result, the unemployment rate for adult women is more than a point lower than it is for adult men! Of course, this doesn't suggest women are better off now than they were 24 months ago. For one thing, this data does not describe income levels for the employed. Furthermore, there are more women (and men) in the labour force due to population growth and other demographic factors. So although there are more workers employed, there are many more looking for work. Correct me if I am wrong, in the last sentence, you are saying "Although there are more people unemployed, but more people looking for job"
It is great that you point out this point.